Paint and Bodywork forum Around here sheetmetal is optional but if you are going to do it, do it right. 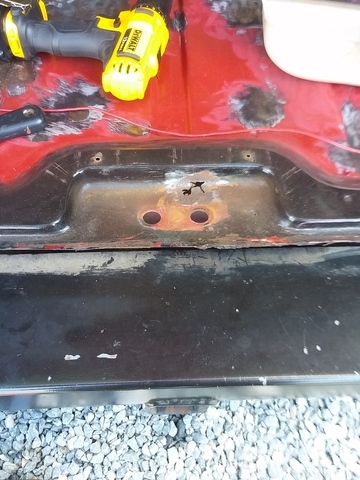 I can't afford a floorpan replacement neither can I weld, so I got to work a different way. 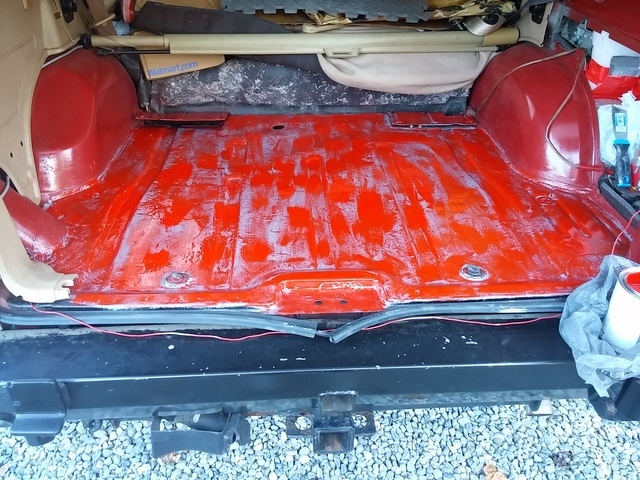 There were dozens of tiny bubbles that I had to wear glasses to identify, and the more I scraped, sanded, wheeled, the more rust spots I revealed. Almost every factory spot weld had rusted to some degree. You see the drill ... I used a wire wheel & different grinding stones to reveal all rust areas. Then I power-sanded the areas that still had paint. Though I didn't intend it, lots of small areas were showing bare metal when I got done. Top coated with an oil-based red - 3 coats (I'm hoping oil based paints offer better water repellence). First coat shown. BTW everything is brush painted instead of spraying. I wanted thicker coats. All done! 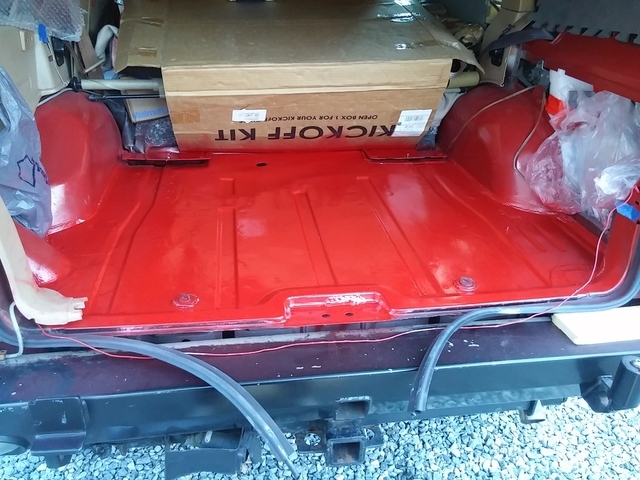 In spite of the multiple coats, I'm putting all my money on the Chassis Saver to seal out moisture. Sprayed a thin coat of (oil based) color to make it closer to the factory tint. 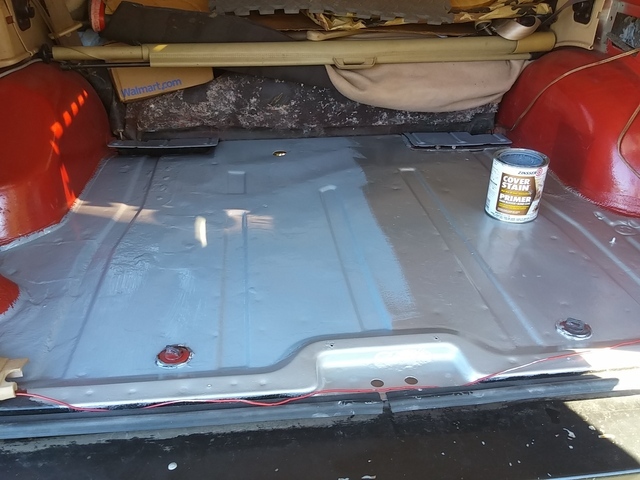 Overall coats brushed on: Chassis Saver - 2; Primer - 1; oil based color - 3; Latex color (for matching) 2; oil based spray color-match - 1. Nine coats over the metal & original paint. Let's see how long this repair lasts. I do have concerns about my handling of the hole by the latch. Wondering if I should have put the Chassis Saver on before the patch. Too late now, but anyone care to comment on that? Or anything else? I recently did pretty much the same thing (but gnarlier rust). Major difference to my process was using fiberglass embedded in POR15 (mimicking their "powermesh" product line). Otherwise same idea. 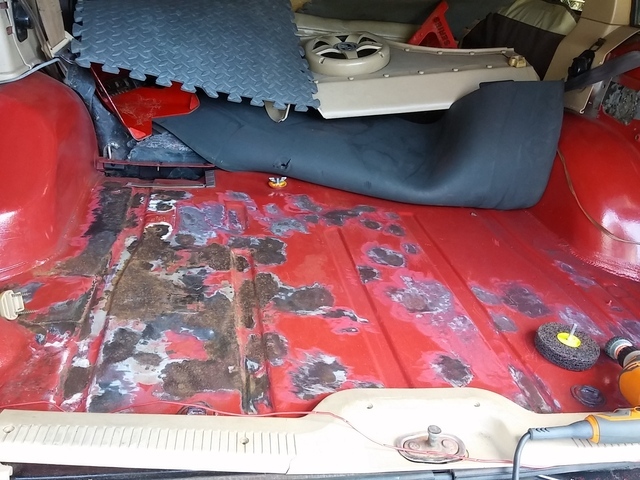 Did you use a rust converter/metal etcher prior to paint? Seems to me if this doesn't last, neither of us is out much... You still fall back to cutting it and out replacing metal. No etch used ... I just sanded the bare metal to promote adhesion. The exposed parts were so small individually. 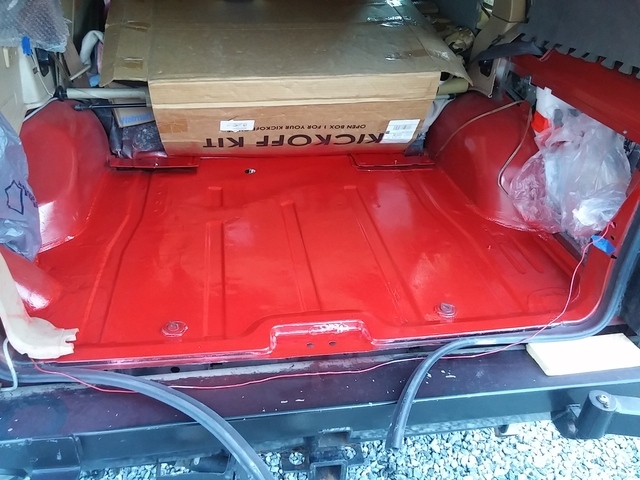 I also really wanted the Chassis Saver to be the first thing to touch the metal, sort of as a "proof" as to whether it will really lock out all moisture. Of course all that work might have been unnecessary if water never gets back there again. But I'm not a gambler? Anyway, I figure my XJ will be long dead before I have to think about rust back there ever again. Not that I hope she dies, just that it'll be a very long time. And seriously only time will tell on this one. It never fails! . This is why I don't GAMBLE. 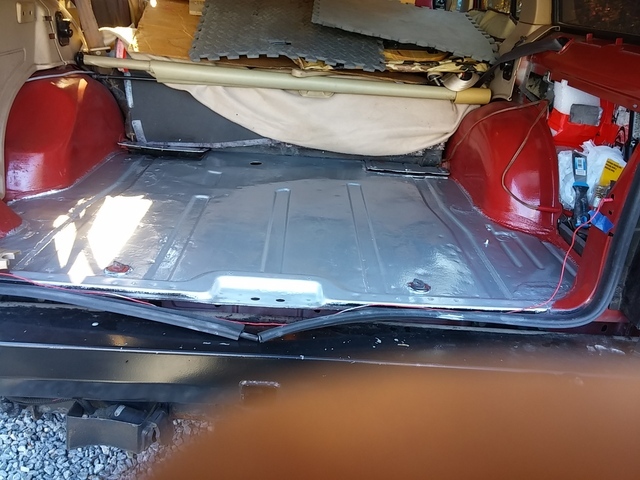 I totaled the XJ in December following this repair. It sat partially covered in my yard until early 2018. 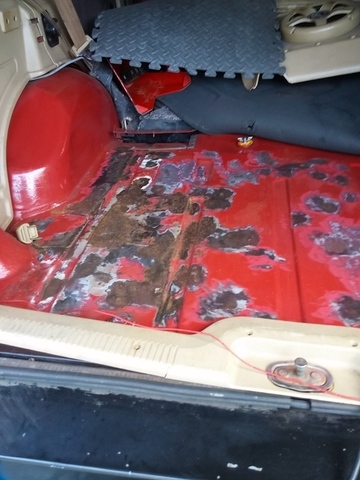 Yes, the interior got rained on in some places, especially the hatch area since the hatch was crushed. For what it's worth, the paint never peeled or bubbled in the repaired area. yay? That's a bummer. I'm sorry to hear that.